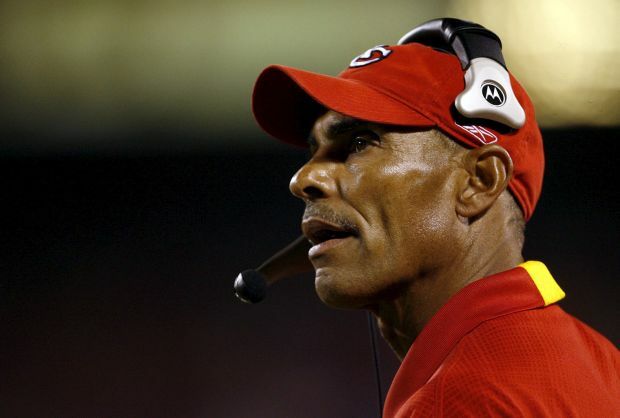 SIOUX CITY, Iowa (CNS) — Football may be Herm Edwards’ forte, but in a keynote address to Catholic school supporters in the Diocese of Sioux City, he talked about his Catholic faith and education. The former NFL player and coach who is now an ESPN football analyst also drew some parallels between coaching and teaching. He addressed 675 people who came from around the diocese to attend the 18th annual Bishop’s Dinner for Catholic Schools held Oct. 12. The evening included the presentation of education awards to three teachers and three staff members from Catholic schools. Sioux City Bishop R. Walker Nickless and Dan Ryan, the diocese’s superintendent of Catholic schools, were the presenters. Each of the teachers received the Excellence in Education Award; the Good Shepherd Award went to the staff members. Ryan reported that the diocese currently has “a lot of great academic initiatives going on and programs that help your students develop their gifts from God,” including a number of construction and other projects at several Catholic schools. In remarks to conclude the evening, Bishop Nickless told attendees he appreciates “the way you care about Catholic education. Lefebvre is a reporter at The Catholic Globe, newspaper of the Diocese of Sioux City.